We can find Iberian jamón de bellota for less than €40/kg and for more than €400/kg. It’s a huge difference which is not justified solely by the quality of the final product, but a combination of different factors. 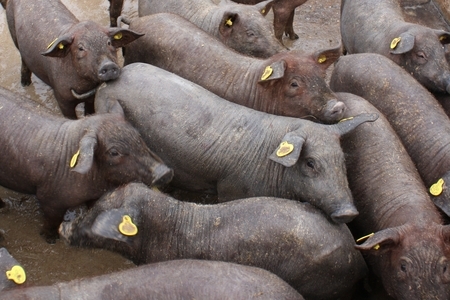 Better quality Pata Negra hams come from 100% Iberian pigs, which cost to raise is significantly higher than cross-breeds. They fatten a lot slower, they produce smaller hams and the litters are smaller in number. From weaning until it is driven to the mountain, the animal spends a few months on a farm, where it is fed on a diet of fodder. The pig can’t go from drinking the milk of its mother one day to eating acorns the next; it needs time to adapt. One example is what we do with human babies. Once they stop weaning we slowly begin to introduce baby food (cereals and fruit), alternating them with a bottle. This goes on for several weeks until the baby is ready to try other foods such as fish and meat, and later on dried fruits and nuts, etc. Returning to animal food, there are many prices that are dependent on the quality of the raw material and the combination of cereals and other nutrients in the formula. The weight on beginning the montanera phase should be between 92 and 115 kg. During the montanera phase they should be fattened at least 46 kg on a diet of acorns and grass. The minimum age at slaughter is 14 months. The minimum individual carcass weight (after removal of the skin, head and viscera) is 115 kg, except for 100% Iberian animals, in which case the minimum is 108 kg. Thus, a producer who meets the minimum legal requirements is able to sell hams with a lower production cost than those who are significantly above the threshold, at the expense of quality, of course. The Royal Decree 4/2014 rules that the pig must spend a minimum of 2 months in the pasture, but there are farmers who extend this by 1 or 2 months, or more. 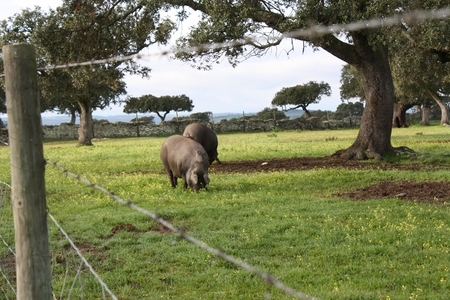 In some cases pigs are given 2 montanera periods. That is, when acorn season is over, they are brought back to the farm until the next season, when they will eat more acorns again. The longer the montanera period is, the more acorns are eaten and the more exercise undertaken, and so the Pata Negra will be of a higher quality. But this comes with a cost: the shepherds and vets must work more, and the number of casualties among the pigs rises as a result of illness, theft or attacks from other wildlife that inhabit the mountain. Furthermore, the jamón will need more months of maturation, because the quality of the fat would be higher and so the oxidation would be slower. It’s not the fair to put 50 pigs in a pasture of 500 hectares, the same as you would put 100 in the same amount of space. They’d get half the amount of acorns. Naturally the law limits the density of animals per square metre, and the density of oaks. Therefore manufacturers need to hire an inspection company to certify that their pastures are compliant. But even within the legal limits there are some producers who are closer to the minimum than others. The quality and quantity of acorns is not the same at all times nor in all pastures. Pigs are very selective and will find the best acorns first, the biggest and sweetest, which are the major contributors to the overall quality of the hams and sausages. Undoubtedly one of the aspects that most influences the final price is the condition of organic ham. The limitation in pharmacological treatments raises the mortality of pigs, the absence of preservatives makes many hams spoil before being sold and the cost of the feed is much higher. We must also add the costs of certification and control of the authorities. Production of organic Iberico ham in Spain is negligible; we only have half a dozen small producers. A Jamón de bellota loses between 8% and 10% of its weight each year that it’s hanging in the cellar (between 7% and 9% in the shoulders). Basically what you lose is water. Thus, if the sale comes within 2 years instead of 3, we can reduce its price by about 10% while maintaining the same margin. Not surprisingly the quality is not the same. One extra year of maturation brings new aromas, a more intense flavour and easier cutting. Excess salt, besides being harmful to health also hides a lot of the flavours of ham. 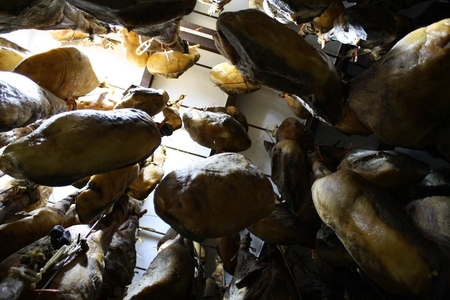 Consumers tend to prefer sweeter and softer Iberian hams, especially in recent times. The muscle tissue loses consistency and flavour. It’s what people in the business call jamón chicloso (gummy ham). Thus, those manufacturers who strive to minimize the concentration of salt to get better tasting hams know they will have to throw out some pieces. Consequently, they’ll have to sell the others at a higher price to compensate for these losses. Prestige, exclusivity and advertising campaigns have a direct effect on the selling price. In 2006 Cárnicas Maldonado launched a special series of €1500 hams called Alba Quercus (renamed Albarragena). Others followed such as Joselito with his Vintage series at €2000 and Jamones Premium by Arturo Sánchez at €4.000… Logically the series don’t last very long; the hams are really good but the price per kg hardly justifies the final quality. In fact, they are often instruments for marketing campaigns. On the other hand, manufacturers with strong brands know that customers are willing to pay a little more for the security that comes with their name and reputation. The country where the trade is largely determines the final price. Some manufacturers require sellers to buy the product to the official importer only, and therefore the prices are usually much higher than in its place of origin or in a more competitive environment. The price of ham is usually quite stable throughout the year, although there may be periods of shortages that drive up the price. It happens, for example, when a manufacturer has exhausted the pieces of a campaign and the next lot are still a little tender.